The 25th Anniversary Edition features a full-length interview with the author by Kathleen T. Horning, Director of the Cooperative Children's Book Center. Ms. Garden answers such revealing questions as how she knew she was gay, why she wrote the book, censorship, and the book's impact on readers – then and now. 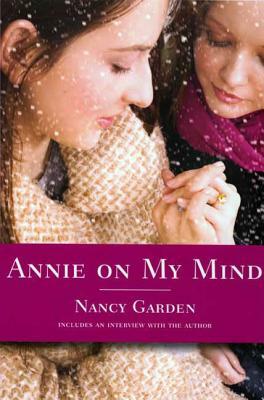 Nancy Garden is the author of young adult novels including Annie on My Mind, The Year They Burned the Books, and Endgame. She is also the author of the YA nonfiction book Hear Us Out!, as well as novels for children and the picture book Molly's Family. Garden was born in Boston, Massachusetts, and has lived most of her life in New England and New York. She spent her early adult years working in theater, doing office work, teaching, and editing. During that time, she wrote in the evenings, on weekends, and on vacations, as well as at odd moments while working. Now she writes as close to full-time as possible. When she isn't writing, visiting schools, or making speeches, she enjoys reading, gardening, hiking, the outdoors, and anything to do with dogs. She has received the Margaret A. Edwards Award, the Lambda Book Award and the Robert Downs Intellectual Freedom Award. She and her partner of over twenty years divide their time between small towns in Massachusetts and Maine.